Today, just as he was a century ago, Field-Marshal Sir Henry Wilson is an archetypal ‘love him or hate him’ character. An agile mind, a sharp, witty and sometimes wicked tongue, and the author of diaries full of the kind of coruscating remarks that a modern tabloid newspaper editor only dreams of. Wilson enjoyed hobnobbing with politicians as much as with his fellow soldiers, often to the chagrin of both ‘frocks’ and ‘brasshats’. The former, so the accepted narrative goes, found him pliable, naïve and ready to do their bidding. The latter, we are told, found him untrustworthy, mendacious and shallow. Yet in his lifetime Henry Wilson’s many genuine admirers included leading figures in both the political and military establishments. Unlike many of his peers, Wilson was unable to present evidence in his own defence in the Battle of the Memoirs which followed the Great War. Soon after his death at the hands of Irish republican assassins his reputation was ruined by the publication of a biography based on his outspoken diaries. Wilson’s enemies had their suspicions confirmed, his friends too often found themselves criticised in his late-night scribblings. More recent scholarship has examined Wilson’s interventions in the cause of Irish Unionism and revealed a ‘political soldier’ willing and able to fight for this in the corridors of power. This study concentrates instead on Wilson’s impact on the development and execution of British military policy during the Great War. Wilson’s contribution to the British Army’s preparations for war is familiar to military historians, his role in shaping policy in the final 18 months of the conflict deserve greater attention. In 1917 Wilson disagreed with the costly attritional strategy of both Sir Douglas Haig, the commander of the British forces in France, and Sir William Robertson, the government’s principle military adviser at the War Office. It was a scepticism shared by British Prime Minister David Lloyd George who found Wilson’s views refreshingly different. As a result, Wilson effectively put paid to a new British offensive in early 1918 and was instrumental in setting up the Supreme War Council, designed to better co-ordinate Allied military strategy. He then dominated the work of this body, setting its strategic priorities and putting in place structures which eased the adoption of unity of command on the Western Front. As this study shows, Wilson was neither the dupe of politicians, nor the hapless hand-maiden to greater military minds than his. Instead, his diplomatic skills helped preserve the brittle Anglo-French alliance, both in the early stages of the war and towards its end. His period as Chief of the Imperial General Staff from February 1918 saw him successfully walk the tightrope between politicians and military leaders and maintain fragile civil-military relations. 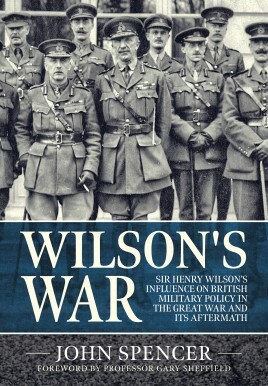 In the aftermath of the conflict, Wilson helped shape Britain’s imperial future, for better and for worse. John Spencer has a particular interest in Grand Strategy and superior direction in the Great War. He completed his PhD on Sir Henry Wilson’s impact on British policy during the conflict in 2017 at the University of Wolverhampton, under the supervision of Professor Gary Sheffield. He has a BA in International Relations from the University of Lancaster and an MA in First World War Studies from the University of Birmingham. John was a journalist for more than 30 years, on regional newspapers and later as Managing Editor of the Press Association, the national news agency for Britain and Ireland. His study of the career of Field Marshal Sir William Robertson has resulted chapters on ‘Wully’ in Stemming the Tide: Officers and Leadership in the British Expeditionary Force 1914, Courage Without Glory: The British Army on the Western Front 1915 and At All Costs: the British Army on the Western Front 1916, all edited by Spencer Jones and published by Helion & Company. John is a member of both the Western Front Association and the Gallipoli Association, and editsRecords, the journal of the Douglas Haig Fellowship. Born in 1961, Gary Sheffield studied history at the University of Leeds, before beginning to lecture on war studies at the Royal Military Sandhurst Academy. He then completed his PhD at King’s College, London.After finishing his studies, Sheffield moved into full-time academia, as Professor of Modern History at King’s College, and then the first Professor of War Studies at the University of Birmingham. He later moved to the University of Wolverhampton.Sheffield has been published widely on military history subjects, with his second book, The Chief: Douglas Haig and the British Army (2011) widely commended in both academic and popular circles alike.Sheffield currently serves as Vice President of the Western Front Association and sits on the Advisory Board of the Royal United Services Institute.